Wow, this is really going to be hard to write about. I'm about done with political autobiographies. Since the Ronald Reagan era, I feel that the ones that I have read have been pretty glossed over. When I read a political autobiography, I usually feel I'm reading the author's "political" version of their life and that they don't really dig deep into anything. 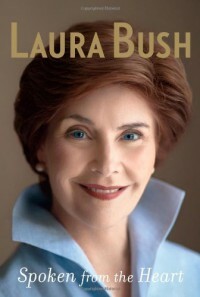 That all said, I picked up this book on Laura Bush, precisely because I could not find a biography on her and I wanted to learn more about her and what made her tick. I decided to break down and read her book. The one overwhelming thing I learned about her is that she is a very intelligent, gracious, down to earth and strong woman. She shares her entire life in the book seemed focused on setting the stereotypes that were pasted on her to rest. I feel that First Ladies of the United States and the President's children should be respected more by the press. I find it very disturbing how the press treats first families in general. I can see how anyone would retreat behind a shell to protect themselves and their families while living in the limelight. It is also very unfair to be harsh on the First Ladies as they are doing a lot of charity work and represent America and it's women. I can see how most cannot really win over the press as they also have to support and campaign for their husbands. I think it's time that First Ladies should receive a stipend or be paid for the work they do. The double standard in American culture towards women is actually quite shameful when you look deeper into these women's lives and see what they have to go through emotionally and how they must work in their position as First Lady. I think this book would have been more enjoyable if Laura had written a memoir of her years in the White House and focused more on those details. Laura's life actually is pretty uneventful and average before she married the most eligible bachelor in Texas. The most interesting thing about Laura is that she married a man who became President. Laura has been very active and busy with charity work which she also documents in detail. I found the reams of information about her charity work very interesting since the media never mentioned it much. She is a champion of literacy, at risk children and women. Laura may not change the world by herself, but she definitely stands on her husband's platform and uses that platform to try and improve the world.